What's T-Trak Network Tram Module Liaison Committee? Welcome to T-Trak Network Tram Module Liaison Committee web page. 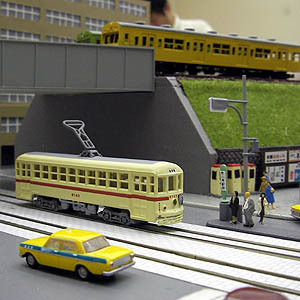 We make Tram Module layout included our T-Trak standard : track spacing 25mm, in Japan. T-Trak standard module : track spacing 25mm is also called The Tram Module. 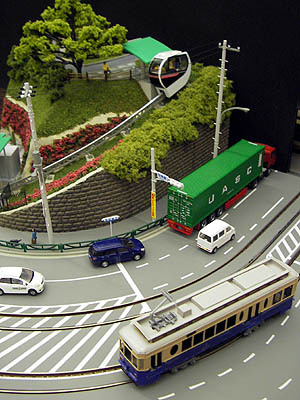 However, The Tram Module concept in japan is not same T-Trak concept. As you know, T-TRAK concept is an American invention of Ms.Lee Monaco-FitzGerald. 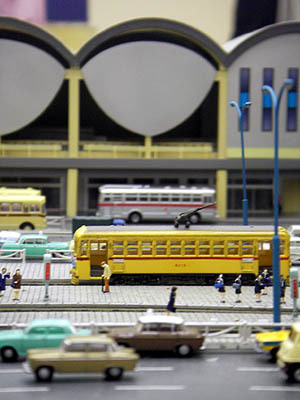 However, The Tram Module module standards were born in 2000, in Japan. It was early when T-TRAK concept was born in 2001, in America. The Tram Module standards is one of the origins of the concept of T-TRAK. The Tram Module standards were designed the RMM Tram Module Promotion Committee. RMM is also called RM Models. 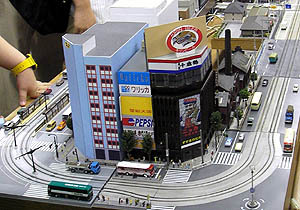 RMM is a model railroad japanese magazine. Please look at History of T-TRAK (http://ttrak.org/) where include in detail of relationship of The Tram Module standards and T-TRAK. And we wrote History of the Tram Module Standards in English page. Please look at History of the Tram Module Standards. T-Trak Network Tram Module Liaison Committee was with pulling the The Tram Module standards from the RMM Tram Module Promotion Committee in 2003. Number of members of our committee is over 60 people. All members made T-Trak standard : track spacing 25mm modules. Some members made T-Trak alternate : track spacing 33mm modules. 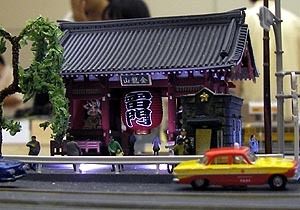 One of our committee member - Mr.Mihara - made over 100 modules , alone. Amount of our committee member's modules is over 200?, 300?, .. , we can not count the number too many. 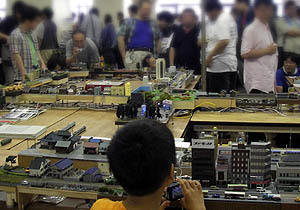 In the model railroad operation meeting, we come from Tokyo, Kyoto, Osaka, Nagoya, Kanagwa, Tiba, Saitama, Gunma, Ibaraki, Fukushima, Miyagi, Iwate and Niigata ... e.t.c. 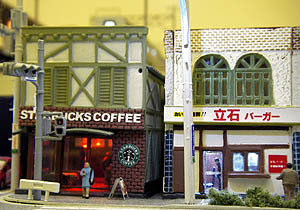 Member lives in a variety of town. We build dioramas to showcase highly detailed building models on board which is the size of A4 paper. We do not ask the size of the Layouts. 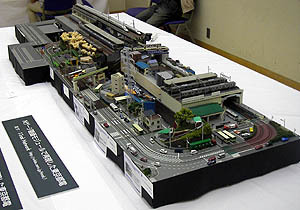 Because, Japan is small and we make module layout for trams or short passenger trains. We do ask to run many trains on layout and to run complex pathes. We use the ATC system created by Mr. Yagyu. Mr.Yagu ATC Systems is not DCC. Please look at Mr.Yagyu ATC system Outline. 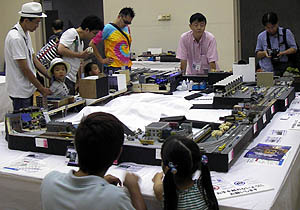 We make every year Tram Module layout in some model railroad events for public, at Kasiwazaki City Niigata Japan, at Asakusa or hamatucyou Tokyo Japan, at Kamata Tokyo Japan, at Oshu City Iwate Japan and Omiya Saitama Japan, in cooperation with other clubs. 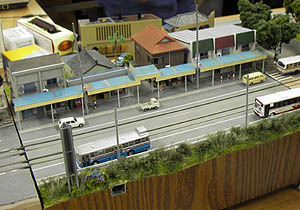 Also, we make every year Tram Module layout in some the model railroad operation meetings for personal, alone. 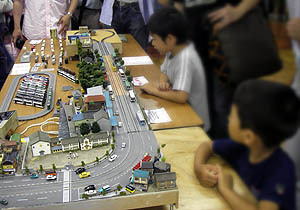 We teach every year how to build T-TRAK module or mini diorama for students at Kawasaki City Kanagawa Japan and Kobe City Hyogo Japan, in cooperation with other clubs. Please look at 'T-Trak Network Tram Modules Events for public'. 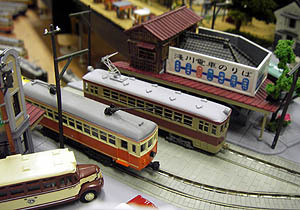 Please look at detail of Tram Modules in T-Trak Network in Japanese page. (c) T-Trak Network 2016-2019. All rights reserved.